The Achilles tendon (or heel cord) is the thick strap that can be felt running down the back of the calf into the heel. The tendon is made up of many bundles or fibres of a strong material called collagen, which is the body’s main tissue building block. It is attached to, and worked by, the large muscles that make up the calf (gastrocnemius and soleus). When the Achilles tendon pulls on the heel it makes us go up on tiptoe, or pushes us forwards when walking or running. If this tendon is not working it is difficult to walk and the ankle feels weak. How does it get injured? Most Achilles tendon problems occur in middle-aged athletes and are basically overuse injuries. In a few cases, other medical conditions contribute to the weakening of the tendon. A high-arched or low-arched foot may increase the stresses on the Achilles tendon. As we get older the tendon becomes less flexible and less able to absorb the repeated stresses of running. Eventually small “degenerative” tears develop in the fibres of the tendon. The body tries to repair these tears. Sometimes the repair process is successful. However, the blood supply of the lower part of the tendon is not very strong and the combination of this and the continued stresses of running mean that the tendon may not completely heal. Instead, the tendon and its lining become painful and swollen, and the tendon may feel weak. The combination of degenerative and repair processes in the tendon is called tendonosis (or sometimes tendonitis). Because the lining of the tendon is called its tenosynovium, inflammation of the lining is called tenosynovitis. Sometimes the tendon becomes weakened by the degenerative process to the extent that it tears completely. The foot on the left side is the injured foot with the ruptured Achilles tendon. The foot on the right side shows a normal Achilles tendon. How would I know if I had an Achilles tendon problem? If you had a complete tear, you would probably feel a sudden pain in your heel or calf. Some people say this feels as though they had been kicked in the calf, or hit them with a squash raquet. Usually the heel becomes painful, swollen and bruised, and it becomes difficult to walk. Tendonosis and tenosynovitis develop more gradually. 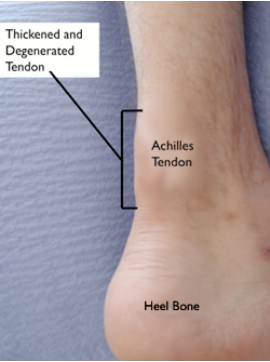 The Achilles tendon and the heel become painful and a swelling may develop in or around the tendon. At first the problem is present mainly on running or playing sport, but later it may become increasingly difficult to walk because of the painful tendon. Can I treat it myself? Achilles tendonosis or tenosynovitis can be treated like any other athletic injury or overuse problem in the first instance. You may need to reduce your mileage or the frequency of your sports for a while. When you do run or play, warm up longer and do plenty of Achilles stretches. A change to a softer running surface and well padded running shoes may help. A 1/4″ raise on your shoe will reduce the stresses on the tendon (remember to raise the other side too, to keep yourself balanced). When the pain and swelling is bad, it will usually be helped by applying an ice pack (a small bag of frozen peas or corn is ideal). For the pain, try simple pain-killers such as paracetamol. Anti-inflammatory medicines may reduce the inflammaton in the tendon, but check with your doctor or pharmacist before taking these as they can have side-effects in some people. Obviously, there is no self-help solution to a complete tear of the Achilles tendon! When should I get professional advice? If you think the tendon has torn completely, you should go to your local casualty department, as you may need to have it repaired. If a painful tendon does not improve with the treatment recommended above, you should consider consulting your GP or physiotherapist. How will my doctor or physiotherapist know what’s wrong? Your doctor will listen to your complaints about your Achilles tendon and will examine you, paying particular attention to the tendon itself and looking for anything else that may be contributing to the problem. Usually treatment can be started without further tests. However, if your doctor thinks the tendon problem is due to some other problem, other tests may be done, such as blood tests for arthritis or diabetes. If there is a possibility that the tendon is torn, a scan of the tendon may be arranged. Often an ultrasound scan will give enough information, but a magnetic (MR) scan is more useful in some cases. An X-ray of your heel is sometimes useful. The first thing is to check that you have tried all the simple measures outlined above. If so, a physiotherapy programme aimed at reducing the inflammation in and around the tendon would be tried. Once the inflammation is improving, the physiotherapist will start exercises to strengthen and stretch the Achilles tendon. If you have a foot shape that increases the stresses on your Achilles tendon, a moulded insole in your shoe may help. Most people will improve with physiotherapy. A few continue to have trouble and in this case an operation may be considered. As explained above, most people will improve with simple measures or physiotherapy. A small number continue to have major problems which interfere with their lifestyle. In this situation an operation may be considered. If an operation is being considered your GP will arrange for you to see an orthopaedic foot and ankle surgeon. The surgeon will interview you and examine you again and may want you to have further treatment before making a decision about an operation. The surgeon would probably want you to have a scan before any surgery, to show whether there is a problem in the tendon which can be corrected by surgery. If there is tenosynovitis but the tendon itself is reasonably healthy, stripping out the inflamed tendon lining often gives good results. If the problem is tendonosis, surgery would involve removing the degenerate tendon and repairing the remaining tendon. If the degenerate area is localised this can give quite good results. However, often the degeneration involves quite a lot of the tendon and removing it all may leave quite a large gap in the tendon which may need a major operation to repair. 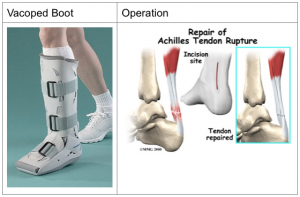 A big repair usually needs tendon borrowed from somewhere else, either higher up the Achilles tendon or from another tendon. As you will appreciate, such a large operation may cause a lot of scarring and stiffness and the repaired Achilles tendon may not be very strong. Other possible problems with major Achilles tendon surgery include problems with the surgical wound (the blood supply to the heel area is not very strong and the wound may be very slow to heal). There is also the risk of stretching or damaging the nerve at the back of the ankle (the sural nerve) causing numbness and tingling along the side of the foot. For these reasons surgery for Achilles tendonosis is only advised when the tendon problem is disabling and extensive non-surgical treatment has been tried. The best treatment for a ruptured Achilles tendon is not known for certain. Most ruptures will heal if protected in a plaster for 6-8 weeks. After plaster treatment there is a higher risk of another rupture (about 15% as against 5% after surgical repair) and the tendon is often weaker than after surgical repair. Nevertheless many people get a good result after plaster treatment and, obviously, avoid the risks of surgery. This may be the best treatment for less physically active people. The greater strength and quicker recovery after tendon repair may be more useful to those who expect to play a lot of sport again. Your surgeon will discuss the options with you to help you decide what is best for you. Will I have to give up running? Usually not. You may need to reduce your distance for a while to allow your tendon to heal. Some people who have surgery will not get enough tendon strength or flexibility to allow them to return to running or sport.